Tall. DOT Contractor. Likes Photography. Wow. Despite the partially covered arrow, this installation gives mixed messages, don't you think? 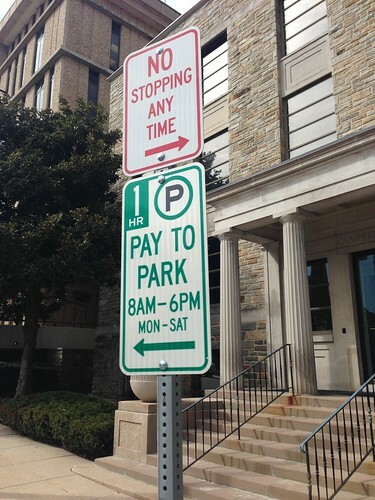 The "pay to park" may be further than the area where you can't park. It's still confusing, though. Yep, the Pay to Park sign is on the wrong post. If you look carefully, there is a different color themed (blue) pay to park sign indicating the meter gadget a little bit down the block (2nd light pole). The yellow signs are what the city uses to indicate parking zone boundaries. The Pay to Park sign is in the wrong location, although I would interpret the sign not as saying "you can park from here on down to wherever if you pay" but rather as saying "you must go to the pay station located down the block that way." 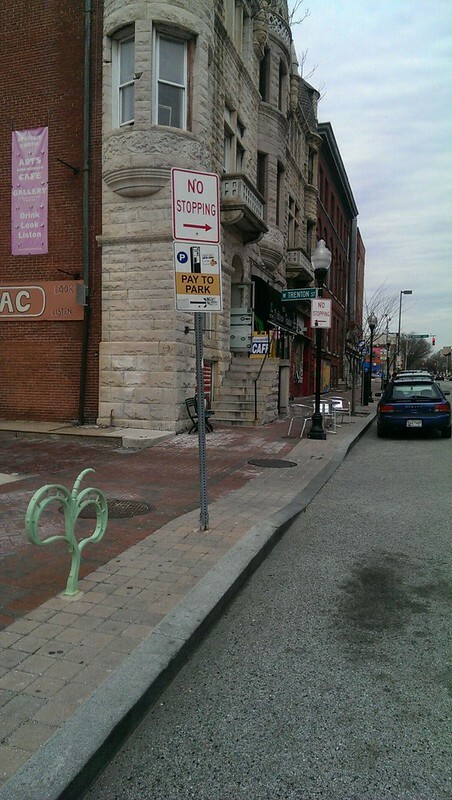 Either way, sign assemblies like this are a good example of the maxim often preached in the District of Columbia, which is known for rapacious parking enforcement: Always follow the most restrictive sign even if another sign appears to allow you to park, or park free, or whatever. In the case shown in this photo, it should be obvious to any reasonable person that you can't park in front of a driveway/alley entrance/exit, regardless of the sign. Of course, if you've ever watched Parking Wars, you know there are an awful lot of unreasonable people out there. Edited to add: BTW, my most recent time parking at a pay-and-display meter was a week or two ago in Arlington at the spot shown here (I was parked where the silver Nissan at the front is): https://www.google.com/maps/@38.884254,-77.101055,3a,75y,191.47h,75.5t/data=!3m4!1e1!3m2!1s5EA0tznqMNtJAIhNzgKBpA!2e0 Weird thing is, there's an old driveway located right there and it gave me pause for a few moments before I concluded the pavement markings made it OK. Here the sign denotes the muni-meter location. If you pan the image around to the left, you can see the sort of sign they use to indicate where you can park and that you must pay (look across the driveway to the left in front of the Acura TL on the used-car lot). It's interesting to note there is no sign indicating you can't park in front of the Nissan, though again the driveway entrance and the pavement marking should indicate that.